So I am definitely not doing the Hawkesbury classic this weekend, as I had not paddled more than 10 KM in one hit between March 30 and last Sunday (the paddle I did on Sunday was a cruisy 18 KM in Matilda with Danielle) I am simply not prepared to do 100 KM in one go this weekend. Instead I will go to Stonefest and Cirque du Soleil this weekend, pretty much going completely the other way from an all night exercise fest. However I have finally been paddling a bit more, on the weekend I did the 18 KM paddle I mentioned, and as day light saving happened the BGCC time trials have been on again. So far I have managed to rock up to two of them. One two weeks ago and another tonight. Surprisingly when I consider the fact I had not paddled at pace since March and I have not paddled much, and that tonight I am still suffering from the effects of a cold I have had for a week and a half now. I managed to do somewhere in the 54 minute range both times for the 9.6 KM time trial. I am fairly happy with this as I was expecting to be a lot closer to 60 minutes again now, I guess I have the technique improving now days and doing the time trial more over summer will simply help me refine both technique and paddle fitness. Although we are blessed in Canberra to now also have My Rainbow Dreams at Dickson for vegetarian/vegan/ceoliac eating (along with the limited selection elsewhere in Canberra for dedicated vegetarian friendly eating). As I noted after my last trip to Melbourne they really have it good down there for a huge variety of great places to eat. Arrival was Saturday afternoon, stayed with friends and had home cooked food, then Sunday morning brunch was had at Invita (scrambled tofu and a number of yummy cakes/muffins were eaten/sampled), dinner that night I wanted to go to Lentil As Anything again however the St Kilda restaurant had run out of food by 8pm and it was too late to get to another. Fortunately there was a Mr Natural (the pumpkin pizza and vegan pizzas were both tried, both with Vegan cheese on top also) vegetarian pizza outlet across the road. They have vegan cheese and all was well. Their pizzas were good, though not as spectacular as I had hoped. Monday morning brunch was at Soulfood (Vegan big breakfast and a number of muffins and cakes were sampled/eaten) which was good, then dinner at Soul Mama (I had the medium, which allowed me my choice of rice and 4 of the dishes to be served with it, all I tried were very good) in St Kilda (on the waters edge in the baths complex) which was large, vegetarian, fantastic view sitting looking over Port Phillip bay and a large variety to choose from at pretty good prices. Lots of yumminess. This morning I met up with an mtb friend for breakfast, once more at Soulfood, then had a soy chai later in the day at Invita again, then I had lunch at Vegie Bar (Mee Goreng which is hokkein noodles, tofu, mushrooms, tomato sort of sauce with some chile, veggies and a peanut sauce) before flying back to Canberra this afternoon. Oh and I had the chance a few times over the trip to go past Lord of The Fries again and actually was able to try out the vegan nuggets, definitely yummy and highly recommended. I have not been to the National Folk Festival for a rather long time now, largely because there almost always is some mtb or similar event on at Easter I tend to be somehow involved with. This may explain why I had never seen Mal Webb, or maybe he was there last time I was and I missed him. Anyway I was able to rectify my lack of knowledge about Mal Webb when I saw him at the Folkus room in Mawson on Friday night. This man is an incredibly talented musician who also happens to be really funny and a fantastic performer, he also seems to understand use of sound and instruments better than almost any performer I can think of. The performance was a lot of fun, and seeing him use his repeat loop box, drum beats form his mouth, pygmy yodeling and a lot of sampling of sounds plus really funny lyrics was worth far more than the entry fee to see the gig of $15. I ended up getting both the cds he had for sale at the gig, his new album "Dodgy" and his second album "3 Cheers for Peace and Quiet", I have had them both on repeat on my ipod yesterday and today. (I was working out at the 24 hour mtb race at Stromlo all weekend so could not listen to them there). Anyway I have to highly recommend all of his music, and suggest trying to catch him if he plays near you. My favourite song by far is "Your One Drop" though I am sure that will chop and change as I listen to his stuff more. Anyway you can hear that song on Mal's Myspace page. While you are there listen to Carrot, URFES and anything else you can too. I suppose you could almost expect me to love this music, after all as they quote on his website, Ani Difranco's assessment of Mal is "You're a freak". On a side note related to this performance, I have never been to the Folkus room before, so when we sat down I was looking around at the decorations and what do I see but a curtain with a large black and white photo of Robert Johnson on one of the curtains hung up in the venue. Earlier on Friday I had read/heard about Robert Johnson for the first time reading an article in Vanity Fair about a potential 3rd photo of him that has now been seen publicly. A few years ago I mentioned a cool t-shirt from a company in the UK called Puzle. I always refer to this as a free ride crossing shirt. However they called it something else (road sign or some such). I never bought one even though I really liked the design as they were far too pricey (something like GBP £25, not including postage). The online store has closed sometime in the past few years. Since that time the store closed and I was never really able to find the image again. Using my old post, the Internet archive and a Google search I found the page on Singletrack that had copies of the image. 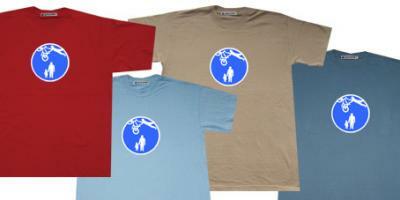 They still had the image on Singletrack, so now you too can see the free ride crossing t-shirt including the variety of colours available. Tres cool, almost tempting to print one myself as a one off now I have the image. What led to the slightly deeper search for the image was that I saw an entertaining quote on an image in an online article yesterday about confusing traffic signs in the US. Their interpretation of sign number 8 was I thought most amusing. 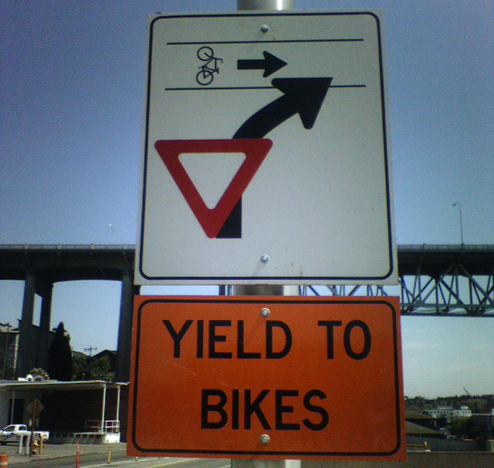 "Yield to people doing wheelies, backwards, into traffic." And I suppose you really should yield to a cyclist doing that, if for no other reason than to stare and wonder. Of course it is entirely possible for fixed gear cyclists to wheelie backwards (as you can see 50 seconds into that video) so the idea is not completely out of left field, simply somewhat unusual. 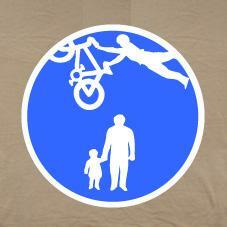 The free ride crossing t-shirt also makes one think of alternate ways highly skilled riders could cross roads. There was the gap jump over the Tour de France a few years ago (2006 Tour I think). Kind of like A and B lines for road crossings. 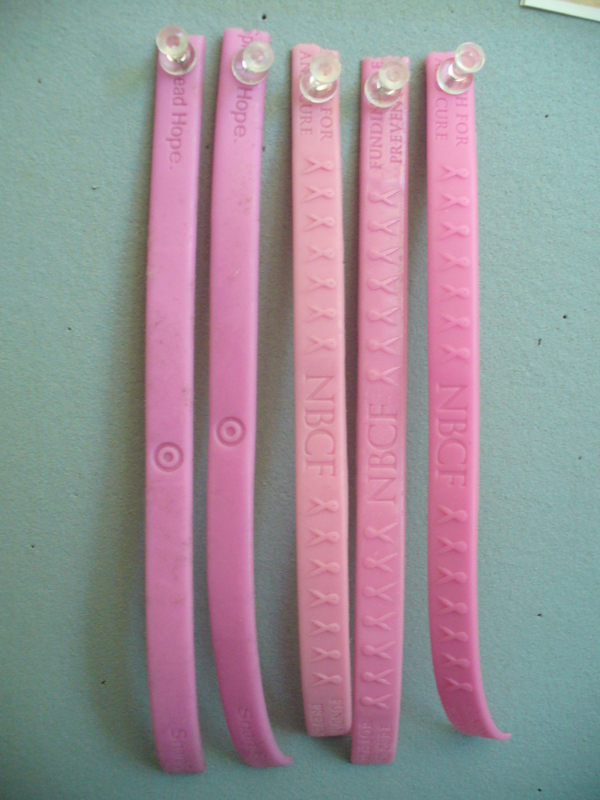 Some of my previously broken bracelets (fullsize) So the good news is that it is October, otherwise known as Breast Cancer Month, which means all the pink ribbon products are in the shops that support the cause. Although I am tempted to buy an entirely pink mountain bike such as is sometimes seen in competitions around this time of year I have instead limited my make a statement style pink purchases to the silicon wrist bracelets. 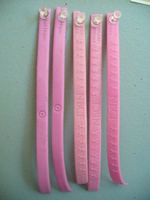 The photo to the left shows some of the broken bracelets. Strangely they just do not last particularly long. I buy 4 or 5 every year and that pretty much lasts until the following October. Still far more interesting that LAF yellow bracelets IMO and they match a lot of my race gear better. Also they still support cancer so I am not completely deserting the idea behind LAF Livestrong bracelets. 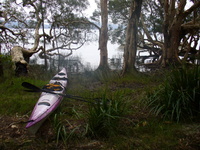 Matilda on the shore of Myall Lake (fullsize) So the weekend of kayaking turned out a little different to the original plan. We had to leave later than planned on Friday so went to Sydney and stayed at Jane's place. Had breakfast at Badde Manors on Saturday morning with Jane then headed up through torrential seeming heavy rain to Taree. Not wanting to kayak or camp in the rain we stayed at my Aunt's place, had lunch with more family who came to visit on Sunday and finally got down to Myall Lakes on Sunday afternoon to head off to camp somewhere. The lakes are a gorgeous area and I am hell keen to go back for a longer trip sometime. The weekend on the whole was enjoyable even though it turned out differently to the plan. It may be nice to camp on the lakes at a non long weekend/holiday sort of time (school holidays are on currently) as there would be less speed boats and water skiers around (you can see a speed boat in the photo). The peaceful camping was rather often disturbed by the noise of power boats. Still it was all fun really. On Sunday I once again had the opportunity to compete in the Sri Chinmoy Googong Multisport Challenge. Somehow, even though I have hardly done any exercise (read training) in 6 months, I fell out of the boat in the paddle leg (and took almost 10 minutes to get back in due to the waves washing into my boat coming from the other side of the dam with the wind) and set a pace that felt like cruising in all the legs on Sunday I was only around 2 minutes slower for the entire race than last year. I have no idea how I managed that, but hey what does it matter, the race was a lot of fun and everyone there seemed to have fun. Due to not sleeping well on Sunday night and probably being a bit tired from the race I did no exercise on Monday and simply went to stretching class. Last night I went for my first real night ride, at night on the mtb, in quite a while with Sam. She was trying out a potential new bike, I took out the single speed and gave the ayups a good hit out. Night riding is fun I need to do more of it. This morning I went with the medium bunch in the road ride, however sat on the front most of the ride so got some work out, I still need to pick my cycling up again. I am looking forward to starting to do some more serious KM on the bike again in the coming months. Exercise wise I am beginning to doubt I will be able to compete in the Hawkesbury Classic this year. After last year I have a fairly good idea about what preparation I need to do for the race. I have hardly sat in the boat for more than 50 minutes at a time paddling this year, I definitely have not done a few 30 KM paddles or other good preparation. I also do not feel as confident as I would like in my black boat at the moment to go for an overnight exhausting paddle in it. As the event is on November 1st and 2nd I do not have much time to decide so really have to come to terms with the event and how I want to approach it, or simply skip it until next year. 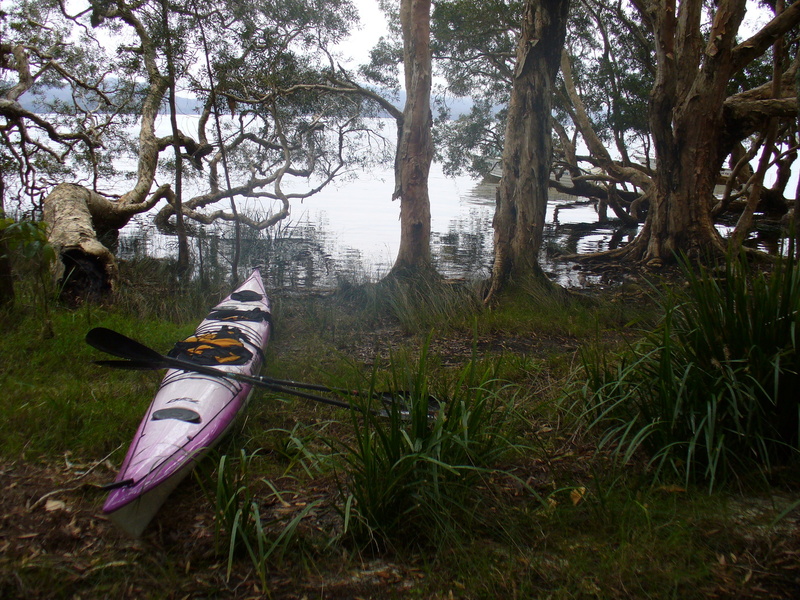 I am heading up to Myall Lakes this long weekend to have a weekend of kayak camping in Matilda, however I am not classing this as paddle training for Hawkesbury.